(Newser) – In May, British painter David Hockney more than doubled his previous auction record with the $28.5 million sale of 1990's "Pacific Coast Highway and Santa Monica," per the BBC. Now, one of his most recognizable paintings could fetch nearly three times as much, reports CNN. 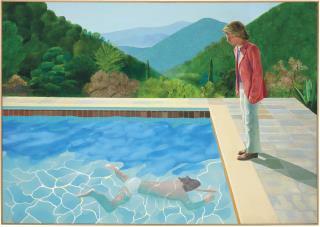 In November, "Portrait of an Artist (Pool with Two Figures)"—one of a dozen Hockney paintings featuring swimming pools, per Architectural Digest—is expected to become the most valuable artwork by a living artist sold at auction. Christie's has set an estimate of $80 million, which would dwarf the $58.4 million auction price for Jeff Koons' "Balloon Dog (Orange)," sold in 2013, per the Guardian. "Christie's has set an estimate of $80 million." "People are out of touch with reality." Gee. At $80 million I'd say some people are very in touch with reality .. . though not with mine. Hey, we have a "reality" Prez .. . why not reality art? Enjoy. This is art huh? A 7th grader can do this. People are out of touch with reality. Hint: If you right-click on the picture you can download it for free!